Then, I have searched more to get additional information about tile adhesives and found many tile adhesive brands in the market. However, the first brand I have to think about is Weber's tile adhesives under Geckotrademark, weber.tai cem (in blue bag) which is recommended! The distributor suggests that weber.tai cem is standard tile adhesive for laying granite tiles, tiles size up to 60x60 cm. The price is inexpensive and good value when compared with its quality. This is why I would like to confirm that weber.tai cem's quality is worth the price as far as I have checked its main points compared with other brands. Therefore, you can notice that Weber's tile adhesives under Gecko trademark cares about people and their environment as product's quality standard is certified on its bag; low VOCS, Green Industry. This tile adhesive can support tiling for good bonding and beautiful works. Mix weber.tai cem in water for a proper proportion (not too thick or too liquid). Then, spread adhesive onto substrate. 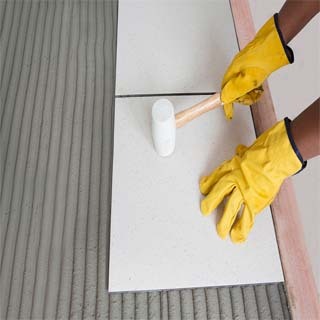 Start to lay tiles by using notched trowel to scrape substrate, and lay tiles in rows together with floor leveling. Adjust tiles vertically after laying and finally leave them for 24 hours before grouting lastly. When use good tile adhesive, don't forget to use efficient tile grout. So that you will no longer have any worries about laying tiles and grouting. Problems of white stain, salt stain, limewater stain, and rusty stain on tiles and grouted joints are normally found on external areas where being covered with granite, marble, or natural stone. Some limitation of timber substrates and cement-fiber boards such as flexibility and water absorption need to be considered when fixing rigid tiles onto these specific substrates.